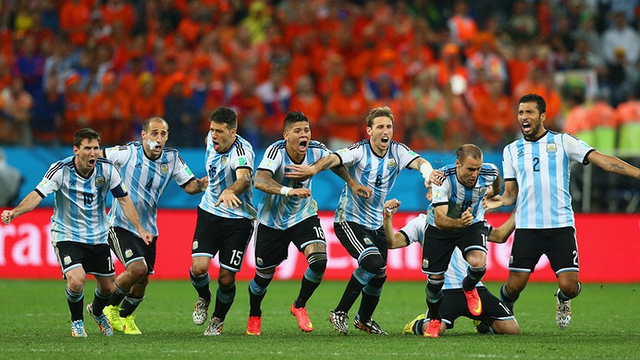 Penalties send Argentina through to the final of the 2014 World Cup. In the first half both teams studied each other and didn’t risk leaving themselves open at the back. An error could have unravelled the game and both teams preferred to try their luck at scoring the opener without leaving too much space for the other side. Sabella’s men, with Messi leading the charge, had a clear chance to score through a free kick and the Netherlands tried to threaten Romero’s goal but were unsuccessful. The scoreboard at the end of the first 45 remained 0-0. The start of the second half was similar to the first 45 minutes. With the rain falling on Sao Paulo, Argentina were the only team that threatened to score thanks to chance created by Lavezzi, but Higuaín was unable to send the ball to the back of the net. Van Gaal’s Netherlands team, on the other hand, had more of the possession, but they couldn’t breakdown the defensive web set up by their rivals. In the last 15 minutes of the game, Higuaín nearly scored the opener but his shot went just wide. Minutes later Mascherano’s last-ditch tackle blocked Robben’s point-blank shot. The teams arrived at regulation time with 0-0 on the scoreboard, it was time for extra time. Argentina was clearly led by Mascherano in extra time, it seemed as though the FC Barcelona player was everywhere. Sabella’s men went forward, aided by the fresh legs of Agüero and Palacios. The Netherlands’ most dangerous player was Robben, who threatened to score on various occasions in the first 15 minutes. In the second half of extra time Palacio had the match winner within reach but his header was easily saved by Cillesen. Serio Romero came up big in the shootout. He saved Vlaar’s attempt while Messi knocked in Argentina’s first. Messi was followed by successful shots from Garay and Kun. Romero went on to save Sneijder’s penalty, which put Argentina up by two goals. Maxi Rodriguez stepped up to the spot and fired to the back of the net and sent Argentina to the finals of the 2014 World Cup.